Back when I first saw the Black & White challenge for the White With 1 blog (and I panicked thinking I cannot do an only black and white layout) I went through my entire craft stash (it's not particularly big now) and pulled out absolutely everything that was black or white - papers, embellishments, ribbons etc. Just looking through the different items gave me so many different ideas, and I could think of two or three different layout options immediately. The first layout I completed is this one that is my challenge entry. And the second is the one I have to show you today. They are both entirely different - in fact I don't think there are any similarities other than the colour. It amazes me sometimes how you can create layouts that are in no way similar when you have used the same products or the same colours. 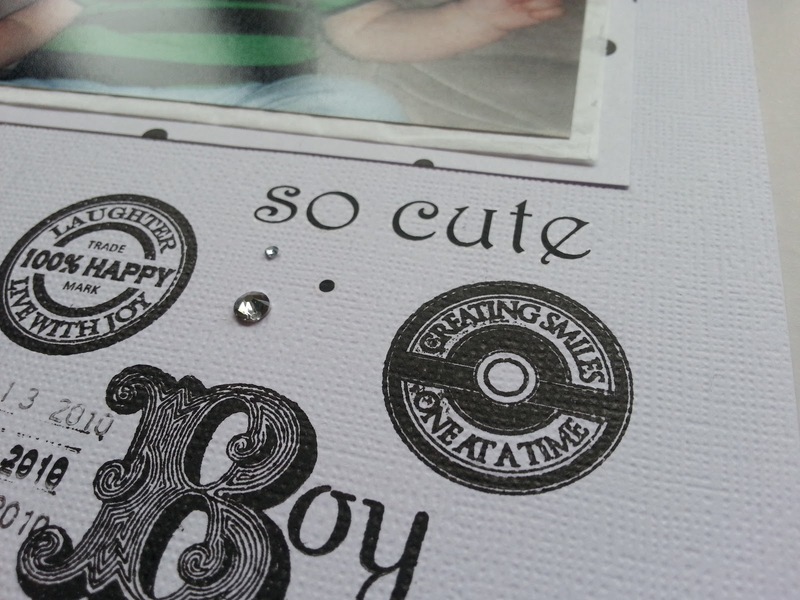 This layout is based on a cheeky picture of my son when he was 6 months old. The only patterned paper used is the polka dots as a single layer behind the photo (with additional layers of white tissue paper) and a strip of polka dots down the left hand edge. 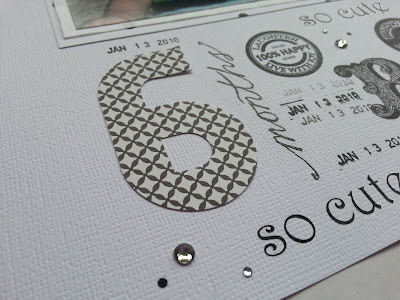 Oh and the number 6 that I made using a project life card and my mini alphabet punch board. The rest of the layout is simply a column of words and phrases above and below the photo. Stamps, stickers, velum, rub-ons and pen. I finished it with a few rhinestones for a bit of bling and texture - and to fill in the big spaces around the other elements. A single line of journaling runs along the edge of the patterned paper strip and that is it. Pretty simple, yet cute and effective. This could be replicated with any colour substitute for black. In fact with other colours it gives you the option of having different shades of that colour, which gives the page different depths and it can look like other colours too (a positive or a negative?) It is a challenge you could set for yourself when you're in need of a boost. Getting out a bunch (or all) of the supplies you have in that colour can be a good starting point for your creativity. It certainly made me look at my supplies in a different way - instead of using them as embellishments on a different project (or not using them at all as the case may be), they turned into the feature of this one. I hope you've been inspired in some way or another today. Thanks for stopping by.